How precious a thing is the human family. Is it not worth some sacrifice in time, energy, safety, discomfort, work? Does anything come forth without work? …Unity and diversity. Form and freedom. Togetherness and individuality. A family. “Use short sentences. Use vigorous English. Be positive, not negative.” The coaching staff’s rules for player engagement, perhaps? No, they were on Chicago-born Ernest Hemingway’s short list of writing keys, most of which he picked up during the six months he spent as a young reporter for the Kansas City Star. By most accounts America’s literary king, he lived a life of adventure and saw his share of combat action, too, which was crucial to his development. In some fashion it was a life later mimicked by Trumane Bell and the itinerant path that led him to the University of Nebraska. 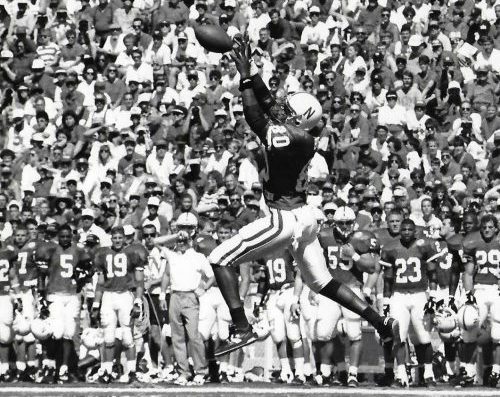 A Windy City friend of a previous Husker, when seconds and yards mattered most this rangy receiver possessing an explosive burst of speed was called upon repeatedly. And he almost- aaaallllmost- pulled off the miracle reception that would have put the Huskers in position for a game-winning field goal for the ’93 National Championship. Surely Byron Bennett would have enjoyed the prospect of a 20 yard chip-shot to the 45 yarder that became his cross to bear, but it was not to be. 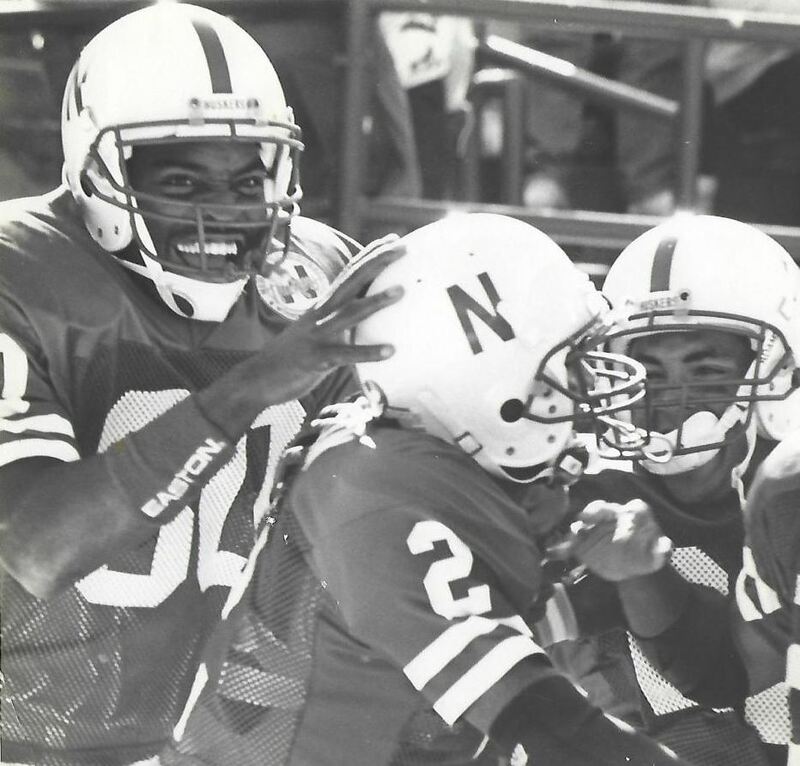 Let’s catch up with a Second City son who still bleeds Husker red. Question: So, Trumane, you’re in Chicago and keeping busy coaching, huh? Q: That’s pretty cool. What position? TB: Tight ends and receivers. TB: I’ve been doing it at the college level for 3 years, and before that I coached at the high school level for 4 years. The University of Chicago. I enjoy it very much. A lot of fun. Q: How did you happen to become a Husker? TB: Well, what happened was, Johnny Mitchell was my best friend in high school and I was down in junior college in Kansas: Highland Community College. I believe it was my freshman year and I just came to the spring game in ’90 to hang out with Johnny and see how he was doing. I went to the spring game and Coach Brown saw me and kind of remembered me from high school. And I said I‘d be interested in playing and he had me fill out a questionnaire. And before you know it I started getting the mail, and the next thing you know I’m getting a phone call and then setting up a trip. And Coach Osborne asks me, “Do you want a scholarship?” I was like, ‘Sure!’ That was pretty much it. Who wouldn’t turn down a scholarship from the University of Nebraska? That’s one of the biggest programs out there. So I came up that summer and just got ready to go out and work and the rest is pretty much history. Q: What summer did you first arrive in Lincoln, then? TB: I believe it was the summer of ’91, and I spent 3 years there. I was there in ’91 and redshirted that first season so I had the ’92 and ’93 seasons to play. Q: What do you recall about your first time visiting campus or arriving there that summer? TB: I would say probably the biggest thing was when I came up on the trip for the spring game and saw like 50,000 people for a spring ball game and thought that was a big deal. I remember standing on the sidelines and people were talking to Calvin Jones -and this was before he even came to the school, because he was still a senior in high school- they were just in awe of this guy. And I remember thinking, ‘Man, this is crazy!’ I’d never seen anything like that before. The next year I arrived and then get my locker, and to see my name on that locker and when you first get that jersey? It was kind of overwhelming, you know? And as a kid it was pretty big to see Nebraska play Oklahoma, so you know about Nebraska Football. Then to actually have that jersey with your name on it and you’re kind of part of that tradition, that was one of the greatest feelings in the world. And it never dies, I still bleed Husker red. I’m disappointed when we lose and I’m on top of the world when we win. So I’m a Husker through and through. It’s almost like I grew up in Nebraska like most of the Nebraska kids, you know? Football, basketball, baseball, Husker red all the way. Q: So your first year, was that Johnny’s last year? TB: Yes, and it was funny. I said, ‘Man, I get here and now you want to leave.’ (laughs) I remember we had a big conversation about him going to the NFL early and what have you. I remember talking to him, ‘Hey, if you think this is something where you have the opportunity to be a first-round pick, go for it. Because that’s what you’re going to college for, to better yourself. And if you get that chance you really can’t turn that down, you know? And you can always come back to school after the fact.’ I was really happy for him. I wished him all the luck in the world. It worked out well for him at that time. I figured if I followed in his footsteps and got a chance to play later on, then great, but I wanted to earn my degree and then if I have a chance to play pro ball, then great. Q: Do you still keep in touch with Johnny to this day? TB: I think the last time I spoke with him was a few years ago. I ran into him in downtown Chicago somewhere. At the time he was spending a lot of time going back and forth between there and Brazil. His wife was from Brazil. Later I heard, I spoke with Nate Turner and heard he was living in Europe somewhere. TB: Oh yeah, I got ahold of him earlier this year and chatted with him. A great guy! Q: Other than Johnny, where there any really good friends you made right off? TB: Oh, yeah, really good friends were Corey Dixon, Sedric Collins, and Dante Jones. They were guys I hung around with a lot. 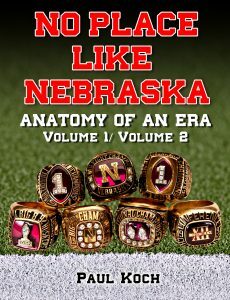 Q: So you go from high school to Kansas and then to Nebraska, was there a unique culture at Nebraska that stood out when you first joined? Q: Coach Brown was your position coach. What can you tell me about him? TB: Coach Brown. I would say he’s very strong in his faith. He’s definitely a person who’s gonna be there for you whenever. He’s definitely gonna give you every opportunity and give you everything he has to make you a better person and a better athlete. I think at times when you’re playing you don’t think about it as much, but when you get older you start realizing things. I see some of the things he taught me on the football field, and I see myself teaching it to my guys when I coach ‘em up. How he lived his life? You strived to be like he is in living his life. He was a very positive impact on my life and how I attempt to live my life. Q: Do you ever find yourself repeating certain phrases that he would say? TB: Yeah. (laughs) It’s funny now that I’m on the other side coaching guys up, and I think back to those days being in fall camp and the spring and you’re tired of hearing the same things over and over again, and I find myself saying the same things to my guys. And it’s so funny and so weird, it’s like, ‘I never thought I’d be saying those same things he was telling me.’ But, ‘Okay, now I see why he said this. I wish I’d paid a little more attention back then.’ So yes, I definitely do it out on the field, yeah. One thing that sticks in my head: if you didn’t go down the field and cut block you weren’t gonna play. And I find myself telling my guys this, ‘Hey, look, if you’re gonna be on the field, you better get down the field and find somebody to cut block. Find somebody and block someone. You’re gonna have to work hard for your teammates.’ That’s the thing I remember in the back of my head that he would always tell us as part of the receiving crew: “Hey, it ain’t all about catching the ball all the time.” Get down the field blocking for guys and doing the other things that most guys, as a receiver, you don’t see on a daily basis in other programs like you used to at Nebraska. Q: Was that a big change for you to be forced to block so much more? TB: I don’t think it was a big change, because when I was in junior college and high school I liked to go downfield and block guys. It wasn’t that big of a change because I did it so much during my high school and junior college career. But I found myself doing it much more, which was okay for me because I was looking for the big hits because I was a bigger receiver. It was definitely in my wheelhouse. It was what I’d do to get the job done. TB: Well, in a cut-block situation? Yes. Because in that situation you definitely knew you were going to get the guy down. If you aim for that thigh pad area and you rip it through you’re definitely going to get them down. He definitely emphasized that, he definitely did. Q: What stands out to you about Coach Osborne? TB: When he and Coach McBride came to my home for my home visit. I can remember Coach Osborne coming in as I opened the door, and he actually had to duck his head to get in the doorway. (laughs) I knew he was a tall guy, but didn’t realize he was that tall when he’d come in the house. I was just in awe, man, ‘Coach Osborne is in my house!’ It was a really big deal. I definitely got recruited out of junior college, but in high school I wasn’t really a heavily recruited kid. So I had to take the junior college route, and I pretty much had a chip on my shoulder because I thought that I was slighted because people didn’t really recruit me. So it made me work a little harder there. So when a program like Nebraska comes knocking it was really, really hard for me not to say yes, and Coach Osborne was really an easy guy to speak with. He was definitely a father figure and he was the type of guy that would say, “We’ll always be there for you and give you chances to better yourself.“ I was really impressed with the fact that a guy that he coached back in the ’70’s, he remembered the guy and was talking about him, and that really impressed me that of all the guys that he’d coached he still remembered and talked about him. That showed that that man cared not just about the program, but about the individual. Q: So number one, you’re amazed that Coach Osborne’s in your house. But Charlie McBride, too? TB: And Charlie was a Chicago guy. He’s in there and you’re talking Chicago things and then you have Coach Osborne speaking to my mom and speaking to my dad. And it’s around Christmas time and we’re all standing in front of the tree taking pictures and everything, so it was really a great experience. And it was just night and day between those guys and their personalities. You’ve got Coach McBride who’s a fiery guy and Coach Osborne who’s really even-keeled. It was very interesting to see them come in the house together, to say the least. Q: I suppose Charlie’s demeanor was calmer during recruiting than it was on the sidelines?